A passionate wartime romance, a star studded cinema legacy and Tim Rice's lyrics all suggest a musical of grand ambition and spectacular promise. 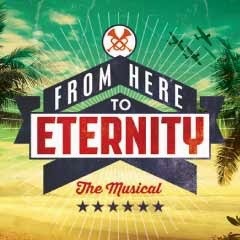 But whilst From Here To Eternity is welcomed as a new piece of musical theatre, as for so many shows or movies themed around Hawaii in that fateful 1941 winter, it proves to be heavy on Pacific promise but, like Soutra Gilmour's (effectively) minimalist set designs, light on artistic content. It's a grand canvas indeed that has a show climaxing with the USA being drawn into the second world war. Set around the American naval base at Pearl Harbour, we meet First Sergeant Warden, who is to fall for his womanizing Captain's wife Karen Holmes and Private Prewitt, a member of Warden’s company, who is to lose his heart to Island whore Lorene. Where one love interest is usually enough for most musicals, to be writing for a quartet of lovers is a potential distraction to both writer and audience. Rice's ambitions are noble, but his scope is just too broad to effectively support such romantic complexity. The show is not helped through the star-casting of Darius Campbell as Warden. Chiselled looks and beautifully voiced for sure, he looks heroic but his acting lacks subtlety and depth and he fails to capture our belief. Robert Lonsdale's Prewitt is a performance that is West End worthy. His take on the song Fight The Fight is stirring and convincing as he grapples with his conscience over being required to fight in conflict. Two reprisals of any song is usually at least one too many and that this song re-appears so often, with other musical motifs returning throughout the evening, indicates that composer Stuart Brayson lacks the talent to match the scale of the show and the renowned wit of his lyricist. The two lead women delight. Siubhan Harrison is Lorene, a character whose tough shell conceals a wise and tender heart and who inthe number Run Along Joe, gives two pleasing and well-crafted perspectives on the same song through its reprisals. It is Rebecca Thornhill as Karen Holmes who shines out amongst the cast. Her loveless marriage now worn threadbare through countless army flings, the poignancy of the love she craves with Warden is compelling. Harvey's direction and Javier De Frutos's choreography is sound throughout even if the constant carrying of metal beds on and off stage by the male ensemble intrudes at times, no more so than half way through the title song From Here To Eternity. The creative pair are at their best though with the routine for You Got The Money that becomes an exciting array of dance, lifts and beautifully timed rendezvous. The story famously builds towards the Japanese attack on Pearl Harbour. A big event that in the West End demands effects that are state of the art. In an era of digital illusion and to audiences used to the best of CGI, the attack as presented here is a damp squib. If, on a fraction of this show’s budget the Southwark Playhouse managed to impressively sink the Titanic earlier this year, then it cannot have been beyond the wit of Rice and his co-producers to know that something spectacular was called for above and beyond the projections that we witness shone onto the Shaftesbury stage. Notwithstanding a closing nod to the human cost of war that is both respectful and moving, From Here To Eternity is much like the US Pacific Fleet, ill-fated and unlikely to remain afloat for long. Saw this last night and I was completely blown away! What a fantastic show and what an amazing cast!